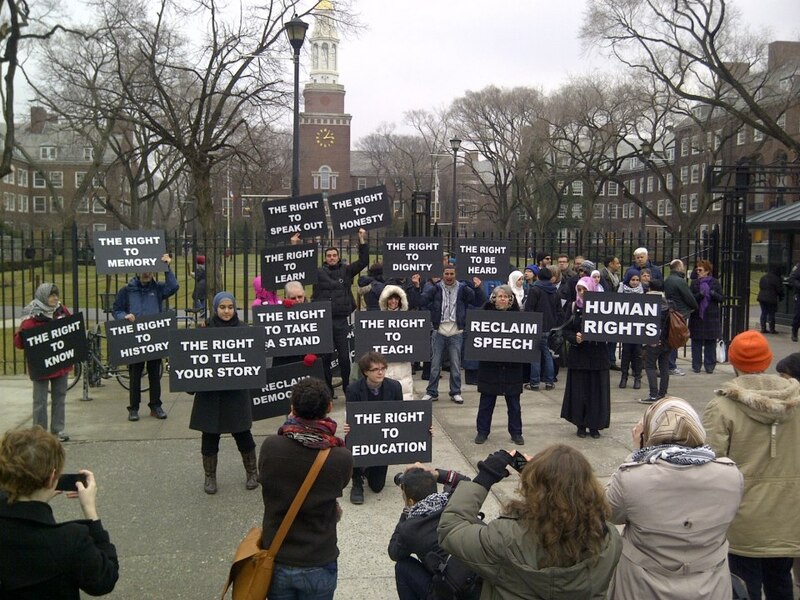 Supporting free speech at Brooklyn College | Jews Say No: Not In Our Name! A talk about Boycott, Divestment, and Sanctions (BDS) on the campus of Brooklyn College with Omar Barghouti and Judith Butler scheduled for February 7 was attacked by elected officials and others. Donna Nevel of Jews Say No! spoke at a press conference at the college on February 5. I am Donna Nevel from Jewish Voice for Peace and Jews Say No! I am pleased to be here today to have the opportunity to speak out in support of Students for Justice in Palestine and all those at Brooklyn College and across the city concerned with ensuring that bullying and intimidation do not succeed in denying students and others the right to engage in critical examination and inquiry of important political ideas. What we have seen happening here is yet another example of an attempt to suppress and vilify voices critical of Israel and Israeli government policies, a pattern that has become far too common in this city and nation-wide. It’s bad enough that Alan Dershowitz and Dov Hikind have engaged in a smear campaign. We’ve come to expect that. But city council members who threaten to take away city funding merely because they disagree with the views expressed on a college campus should be ashamed of themselves and should be held accountable for trying to interfere in this way. And they must not prevail. About the topic that has become so controversial and caused so much condemnation- It needs to be made clear that Boycott, Divestment, and Sanctions (BDS) is a non- violent response to the Israeli government’s violation of basic principles of human rights and international law. It is, in my view, those violations that should be condemned, not strategies such as BDS that are designed to put an end to those violations, and the injustices that they inflict on the Palestinian people. In the eight years since hundreds of Palestinian civil society organizations called for BDS — similar to the boycott/ divestment movement against South African apartheid — it has garnered strong international support. And for good reason. It is a common ploy to suggest that criticism of Israel is anti- Semitic. It is a ploy that trivializes the long and ugly history of anti-Semitism. I want to mention that there were over 2,000 signatories to the Jewish Voice for Peace petition supporting the event and the President’s decision not to capitulate to those pressuring the university. We are heartened that Brooklyn College is resisting the calls to abandon what higher education should be—a place for learning, and challenging, and critical thinking, where students are pushed to imagine and to envision how they can participate in making the world a better place for all peoples and for all communities. With the pervasiveness of Islamophobia and anti-Arab racism and the targeting of communities of color in NYC, and with the attempt to silence those whose views on Israel do not mirror Israeli government or US policy, colleges standing strong against political opportunism and attempted coercion are more important than ever. This entry was posted on February 20, 2013 at 4:32 pm and is filed under Uncategorized. You can follow any responses to this entry through the RSS 2.0 feed. Both comments and pings are currently closed.